Another Michelin starred restaurant we visited in Barcelona was Hisop. This restaurant is helmed by 2 chefs - Oriel Ivem and Guillem Pla. 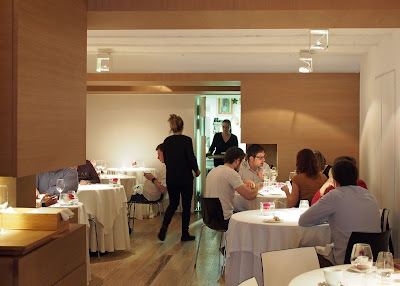 It is located in the quieter neighbourhood of Sarria-Sant Gervasi. 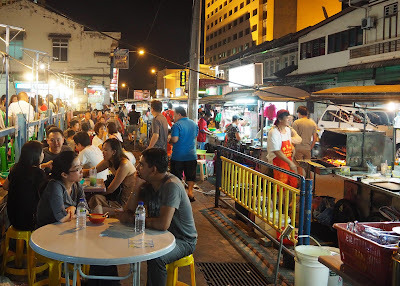 The restaurant is quite small and because of that it provides an intimate environment to dine in. The walls are bare and white, and one side of the room is dominated by a full height cabinet which hides all the plates and cutleries. There was a glass window into the kitchen where you can see the chefs at work. 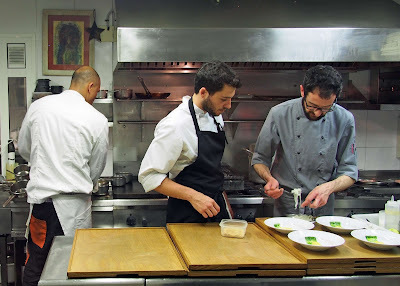 Its a small kitchen with a small team working behind the scene. Unlike most celebrity restaurants - it is nice to know that here the chefs are actually doing the cooking. We had the set lunch menu which came with 5 courses and a dessert. 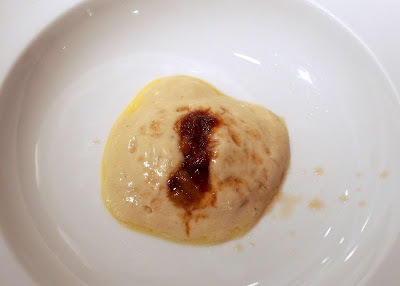 The first course was Sea Urchin with Vermouth. The sea urchin was made into a mousse - topped with a orange coloured sauce. It looked simple but tasted very good. Wish the portion was a bit bigger. 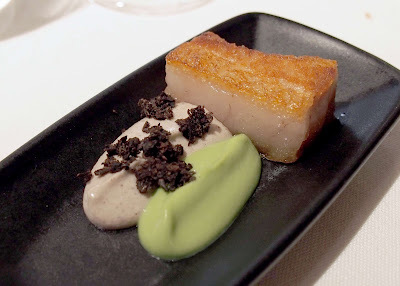 2nd course was Pork Belly, Peas and Truffle. The pork belly was melt in the mouth - and coupled with the pea and truffle mousse it was a very luxurious dish. 3rd course - Squid with Trumpets, Sausage and Fennel. Can't really see the trumpet mushroom, sausage and fennel - they must have been made into the black dust that was sprinkled on the squid slices. 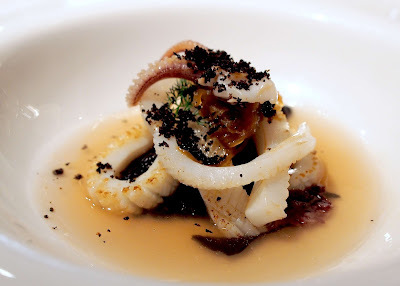 The squid was perfectly cooked - very tender, and the dust had a lot of complex flavours which complemented the squid really well. This was one of my favourite courses. 4th course - Grilled Brill with Chard and Soy. By now you would realise that the chefs at Hisop like to play with just a few ingredients, and let the freshness of the ingredients and the clever combination do the trick. This was good - but not as good as the squid and the pork. 5th course - Suckling Pig and Black Cardamon. Surprise - another pork dish. This was even more tender then the pork belly and had a crisy crust. 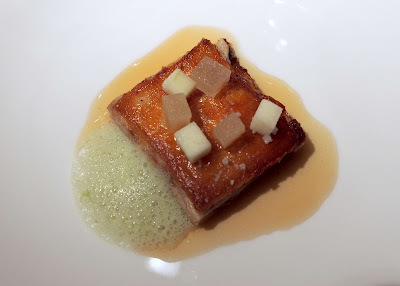 The forgot to mention the cubes of apple which complemented the pork really well. Another great course. After a shot of mojito to cleanse the palate, dessert was served. It was Mandarin, Juniper Berry and "Tocinillo". 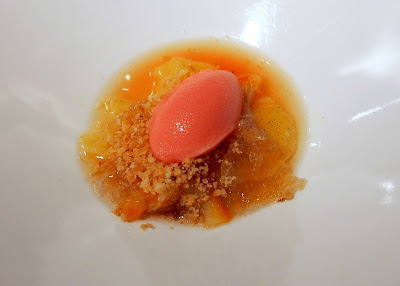 There were fresh mandarin segments, a very light custard underneath, and Juniper Berry ice cream. It looked beautiful and was delicious. The lunch at Hisop was a really nice experience. It was great innovative cooking with respect to the ingredients. 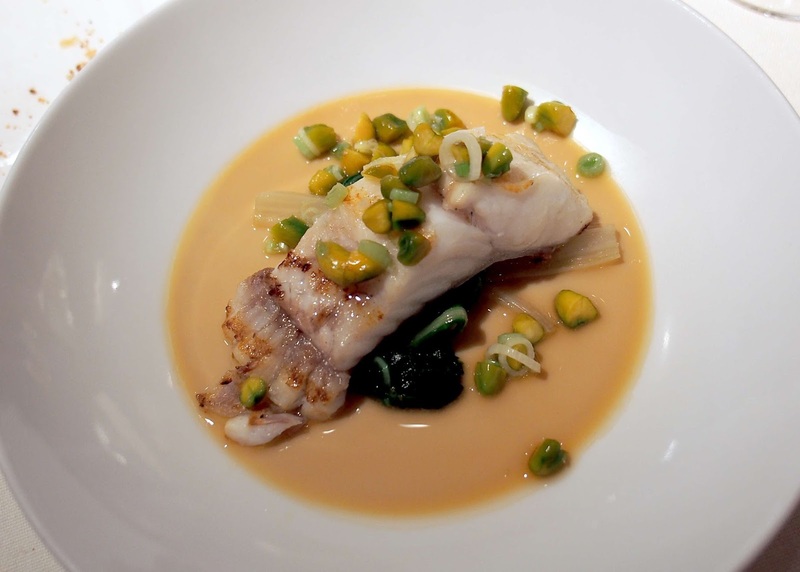 The flavours were not overly complicated and the chefs let the ingredients shine. Service was a bit erractic but not lacking charm. 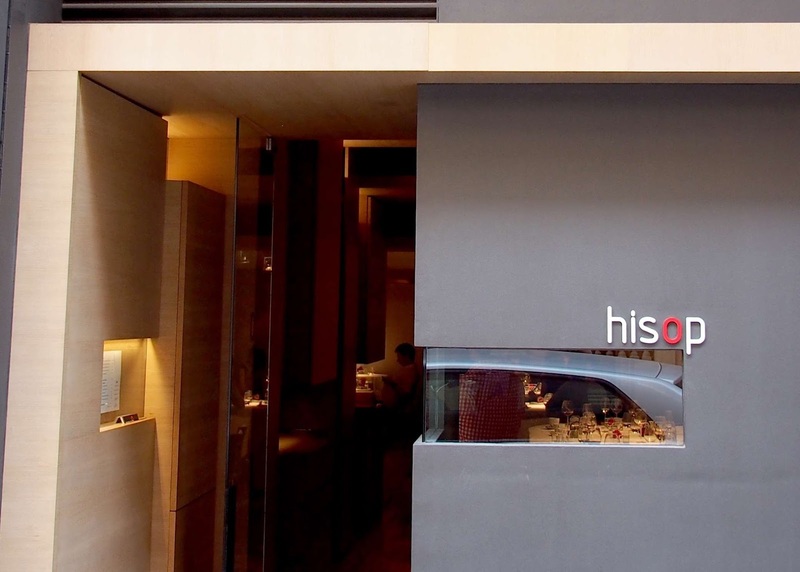 Hisop is a restaurant well deserving of its 1 Michelin star.